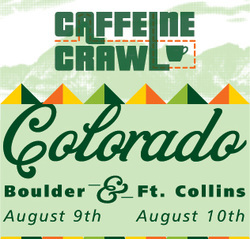 Colorado in the summer is pure magic, and we fell in love with coffee all over again on the fourth annual Colorado Caffeine Crawl. Boulder welcomed us with abundant mountain sunshine as we gathered in front of Innisfree Poetry Bookstore and Cafe for intros from Mark of Conscious Coffees. Crawlers grabbed event bags of fabulous swag from Wholesome Sweeteners, Barista Magazine, Sleeve a Message, Yelp, Earnest Eats, Good Drinks, InterAmerican Coffee and Rip Van Wafels before heading inside for espresso, or across the street to Buchanan’s Coffee Pub for brewed tastings. We sampled Honduran coffee at Ozo, a refreshing Nitro Toddy on tap at The Cup, and Orange Coffee Soda and a take on Mint Juleps at Boxcar, where crawlers got “behind the bar” and pulled shots on the Stella di Cafe Barista Nation Custom Espresso Machine. A local farmers market accommodated Precision Pours - A Mobile Coffee Bar, and we enjoyed coffee three ways from Brice and team. Jerry at Unseen Bean offered inspiring insight into roasting without the visual aspect, and Piece, Love and Chocolate showcased Tiramisu Macarons, Drinking Chocolate and frozen treats. Sunday dawned in Fort Collins, and after friendly introductions at Old Town Square we sampled cold brew at The Kitchen, Irish Cream Toddy and scones at Starry Night Cafe, and washed vs. natural Ethiopian Yirgacheffe at The Bean Cycle. Happy Lucky’s Tea House served up Matcha shots and Guayusa tea, and Jonathan at Harbinger offered a coffee trifecta involving a entertainingly luscious coffee foam. Colorado’s vibrant scenery and culture made this a crawl we won’t soon forget - caffeinated and inspired, we can’t wait for next year.